First, I'm not sure if this is the right forum for this post, so my apologies if I've come to the wrong place. I am completely new to uGFX, and have not even downloaded it yet. I'd like to ask first if it will meet my purposes, as follows. I am a hobby electronics enthusiast, retired from a working life in electronics. My preferred uP is from the Microchip PIC18 range (specifically PIC18F25K50). I use the MPLABX IDE platform with XC8 compiler. I am far from expert in C code, but have learnt enough to be comfortable with the Microchip methods and libraries. My projects usually involve displays of one form or another. Up 'til now I have used small LCD and OLED panels, and am well familiar with driving them. I now want to experiment with E-paper displays, and have decided to start with the Waveshare 2.13inch E-paper HAT board. It uses an SPI interface. I have downloaded example code for this Waveshare part, from Waveshare itself and a few other sources. I had hoped to hack example code to suit my PIC18, but there is a major hurdle which I cannot get past, namely all example code seems to be written in CPP, which is no use with the XC8 compiler. Microchip do not offer a CPP compiler for their 8 bit parts, and it is beyond my abilities to translate the CPP code to C.
SO -- I wonder if uGFX can help me here ? Can it generate code to drive this Waveshare display ? How will it link in with MPLABX IDE ? Does it generate C code ? I am not even sure if these are sensible questions, and I suspect there are others I should be asking. 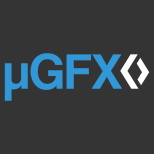 uGFX is a graphics library that makes abstraction from the hardware that you use. So you can write a prom that uses the uGFX library to draw things on the screen, reads user input etc.. without knowing what hardware you are using (in theorie). The board file includes functions that send data to the display over a certain interface (depending on the display used). In your case the display uses SPI so the board file will contain functions that use SPI to send data to the display. For an example see the post above. To summarize, you will have to write a driver (gdisp_lld_xxx.c) for your EPaper display and a board file (board_xxx.h) that implements the SPI interface between your MCU and the display. There are a few EPaper drivers already in the repository that you can use as a template. The ED060SC4 driver handles an EPaper display without a controller chip. The UC8173 driver is probably the most complete EPaper driver, even supporting loading of temperature and waveform profiles. I think the UC1610 is also an EPaper controller. I don't know how close any of those are to the HAT EPaper display that you have (or the Waveshare driver in the above post by cpu20) but it should give you an idea. Thanks for reminding me about the WS29EPD driver. It is now in the repository. Meanwhile, I have been working away at the code I already have, and after many hours I think I am just about at the point of getting it to work. I have the advantage of having a 'scope to look at SPI waveforms. The display works correctly on a RaspberryPi board with the CPP code from Waveshare, and so I can capture known working SPI waveforms to compare with what my plain C code generates. More to do, but I think I'm nearly there. I have downloaded the files from "cpu20". In fact, they look very similar in structure to the code I am working with, so for now I will continue on my present route. But these new files could still prove very useful. I will keep you posted on progress. When I do get it working I will start work on using the uGFX graphics library.